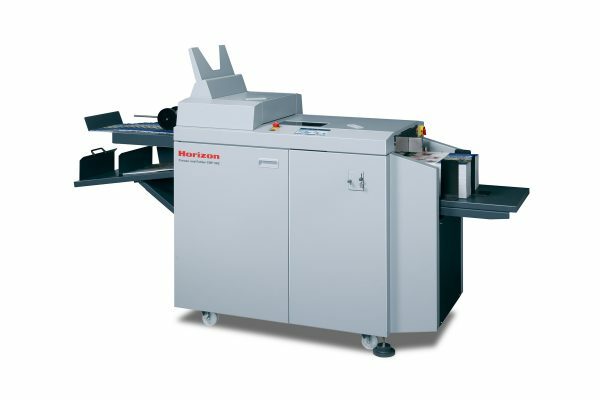 The new Standard Horizon CRF-362 Creaser/Folder has been designed to handle the unique requirements of creasing and folding digital color output across a wide range of light and heavy weight stocks, coated or uncoated. Creasing and folding can be done in one pass for easy and accurate processing of a variety of applications such as restaurant menus, greeting cards, book covers, and marketing collateral. Capable of up to ten crease lines on a sheet, the system uses an impact scoring technology that eliminates or minimizes cracking of the stock or printed image. Set-up and changeovers – including fold pattern, creasing number, and up/down crease selection – can be easily achieved through the high resolution color touch screen designed for simple and intuitive operation. The Standard Horizon CRF-362 Creaser/Folder eliminates cracking on digital color output and accepts a wide range of coated, uncoated or laminated stocks from 24 lb. bond to 18 pt. on sheets up to 14.33″ x 34″. Features 7 selectable fold patterns and 6 selectable cover creasing patterns for perfect binding. Stores up to 200 custom formatted jobs in memory. Crease and fold up to 5,000 sheets/hour.